Established in 1995 at Pearcedale and relocated in 2010 to Boolarra Sth in the beautiful Strzelecki Ranges of Gippsland, Stokesay Mohair Farm is home to one of Australia largest herds of rare coloured angora goats as well as a herd of traditional white angoras. The goats are shorn twice yearly for the highly prized fibre, which we then wash, sort and dye as required to make a wide range of mohair products. 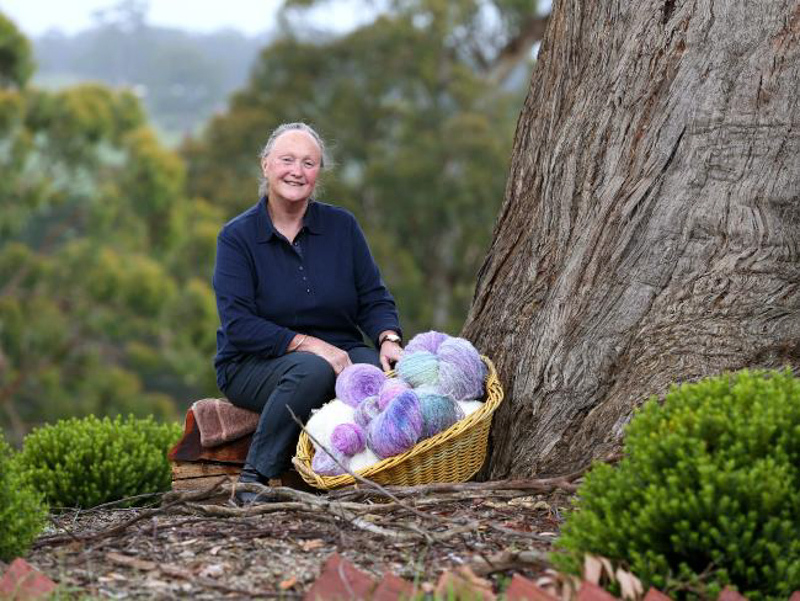 We were privileged to be featured in a Weekly Times multi-page profile of our farm and mohair. If you'd like to read the article, click here. At the end of March, these two young joeys were released onto our Boolarra property. The joeys were rescued from the pouches of adult kangaroos who were killed by cars in the local area. They were brought into Jean Quicks' Wildlife Shelter in Boolarra, where they were placed into manmade pouches and bottlefed by Jean until they were old enough for release. Once released, we try to interact with the joeys as little as possible to prevent them becoming tame, but they need a safe place to begin their exploration of the environment. We keep a close eye on them during the first few weeks and months to give them the best chance possible of succeeding in their natural habitat. These two joeys have settled into their new home very well and are free to move on, but so far have chosen to hang around! Over the past few years seven joeys have been released onto our property, and whilst a number have chosen to move on and join other local mobs, several have decided to stay close by, effectively forming a new mob on our land. Each year a limited number of our exotic coloured mohair goats are offered for sale. This is mohair as you've never seen it before - sultry and sensuous. Please contact us via email if you would like a copy of our 'Black is Beautiful' brochure, which gives an overview of the management and needs of these beautiful, intelligent animals. At an auction in Seymour we were fortunate enough to purchase two elite bucks from interstate, Cedar Grange Havana (NSW) and Lynndon Grove Falcon (SA). These bucks will bring valuable new genetics into our herd and should open up new breeding opportunities in the future. Other purchases include a beautiful yearling doe, Culbookie Tanie from NSW. Stokesay Mohair Farm is also home to a small herd of boer cross goats, used for weed control in a couple of steep gullies at the Boolarra farm. These goats are very robust, surviving, and in fact thriving, in conditions that most other animals would find a challenge. Pictured at right are Rusty and Dorothy happily at work at Boolarra. First, the grass is cut and left to cure for several days, then it is raked into windrows. The bales are then collected and stored in a huge hay shed until such time as it is needed. The windrowed hay is baled.